You just can’t help but fall in love with this beautiful Children's Large Gingerbread Cottage Playhouse, the perfect place to inspire creative and imaginative play. 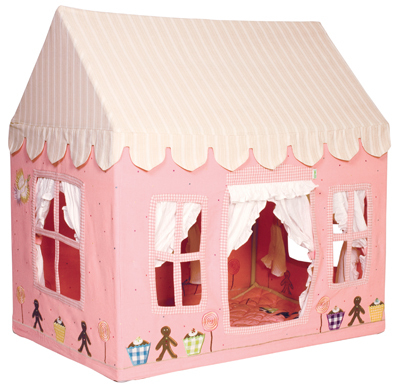 This playhouse is 100% cotton with delicate details which make the playhouse distinctive. 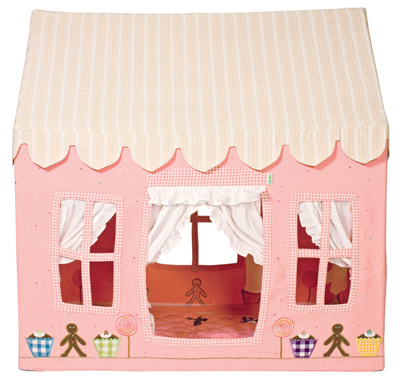 The soft pink fabric playhouse is appliquéd and embroidered with gingerbread men, cupcakes, and lollipops and finished off with a delicate dusting of multi-coloured dots ... its every girls dream! Pretty curtains add the finishing touch. The playhouse has a stripped pink roof with pink gingham trim around the windows and doors. Whether the playhouse is used inside or outdoors on dry days it is easy to assemble with a light metal frame and comes with its very own canvas storage bag where it can be stored away conveniently when not in use can be easily spot cleaned as it’s made of 100% cotton.